What is Fancy Feast Elegant Medley Florentine? Fancy Feast Elegant Medleys are delicious-tasting restaurant-inspired recipes for your cat. The Florentine Recipe collection offers delectable Italian flavors with quality ingredients like white meat chicken, tender turkey, wild salmon, and yellowfin tuna. Each Florentine Recipe is prepared in a delicate sauce with garden greens. Buy Fancy Feast Medleys with confidence with our 100% satisfaction guarantee. 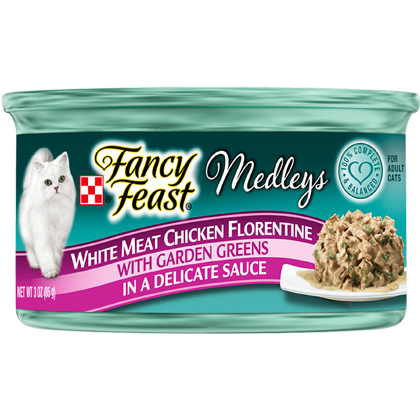 Fancy Feast Medleys offer your cat delicious restaurant-inspired taste with quality ingredients like white meat chicken, tender turkey, wild salmon, and yellowfin tuna. Daily ration for an average adult cat is 1 can per 2-1/2 pounds of body weight. Feed up to twice this amount to kittens. Ingredients: Poultry broth, chicken, wheat gluten, liver, meat by-products, spinach, turkey, corn starch-modified, artificial and natural flavors, calcium phosphate, added color, salt, soy protein concentrate, potassium chloride, taurine, choline chloride, magnesium sulfate, thiamine mononitrate, Vitamin E supplement, zinc sulfate, ferrous sulfate, niacin, calcium pantothenate, Vitamin A supplement, menadione sodium bisulfite complex (source of Vitamin K activity), copper sulfate, manganese sulfate, pyridoxine hydrochloride, riboflavin supplement, Vitamin B-12 supplement, biotin, folic acid, Vitamin D-3 supplement, potassium iodide. Ingredients: Poultry broth, turkey, wheat gluten, liver, meat by-products, spinach, corn starch-modified, artificial and natural flavors, salt, calcium phosphate, added color, soy protein concentrate, potassium chloride, taurine, choline chloride, magnesium sulfate, thiamine mononitrate, Vitamin E supplement, zinc sulfate, ferrous sulfate, niacin, calcium pantothenate, Vitamin A supplement, menadione sodium bisulfite complex (source of Vitamin K activity), copper sulfate, manganese sulfate, pyridoxine hydrochloride, riboflavin supplement, Vitamin B-12 supplement, biotin, folic acid, Vitamin D-3 supplement, potassium iodide. Ingredients: Fish broth, salmon, wheat gluten, liver, meat by-products, spinach, chicken, corn starch-modified, artificial and natural flavors, added color (Red 3 and other color), salt, calcium phosphate, soy protein concentrate, potassium chloride, taurine, choline chloride, magnesium sulfate, thiamine mononitrate, Vitamin E supplement, zinc sulfate, ferrous sulfate, niacin, calcium pantothenate, Vitamin A supplement, menadione sodium bisulfite complex (source of Vitamin K activity), copper sulfate, manganese sulfate, pyridoxine hydrochloride, riboflavin supplement, Vitamin B-12 supplement, biotin, folic acid, Vitamin D-3 supplement, potassium iodide. Ingredients: Fish broth, tuna, wheat gluten, liver, chicken, meat by-products, spinach, corn starch-modified, artificial and natural flavors, added color (Red 3 and other color), calcium phosphate, salt, soy protein concentrate, potassium chloride, taurine, choline chloride, thiamine mononitrate, Vitamin E supplement, zinc sulfate, ferrous sulfate, niacin, calcium pantothenate, Vitamin A supplement, copper sulfate, manganese sulfate, menadione sodium bisulfite complex (source of Vitamin K activity), pyridoxine hydrochloride, riboflavin supplement, Vitamin B-12 supplement, biotin, folic acid, Vitamin D-3 supplement, potassium iodide.